Land Rover Discovery Boot Space, Size, Seats | What Car? It doesn’t matter what size or shape you are, you’ll have head room to spare in the front of the Discovery – broadly speaking, that's the case in the vast majority of luxury SUVs. Yet, if you are really tall – we’re talking well over six feet – you may notice that the Discovery’s seat doesn’t slide back quite as far as it does in rivals such as the Volvo XC90 and Audi Q7. The Discovery does have one of the widest interiors in the class, though, so you'll have plenty of room between you and your passenger. Where the Discovery soundly thrashes its rivals is on stowage space: you can fit a 1.0-litre bottle in each front door pocket and up to four iPads in a deep pocket between the front seats. Another ingenious use of space is the secret stowage compartment in the middle of the dashboard. You simply push a button and the air-con control panel folds down to reveal a space big enough for a couple of wallets or mobile phones. And there are two gloveboxes. 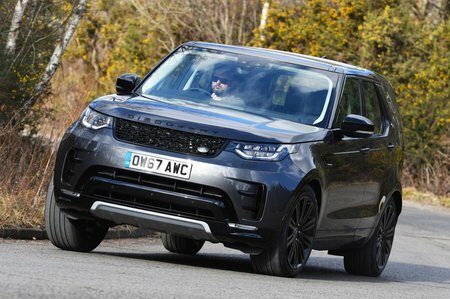 Those sitting in the second row of seats will find loads of head room, and the sheer width of the Discovery makes sitting three abreast pretty comfortable for all concerned, especially since there’s no central tunnel in the middle of the floor to rob passengers of foot space. But leg room isn’t quite as good as in the XC90 or Q7. However, compared with the competition, those sitting in the third row will be happier. 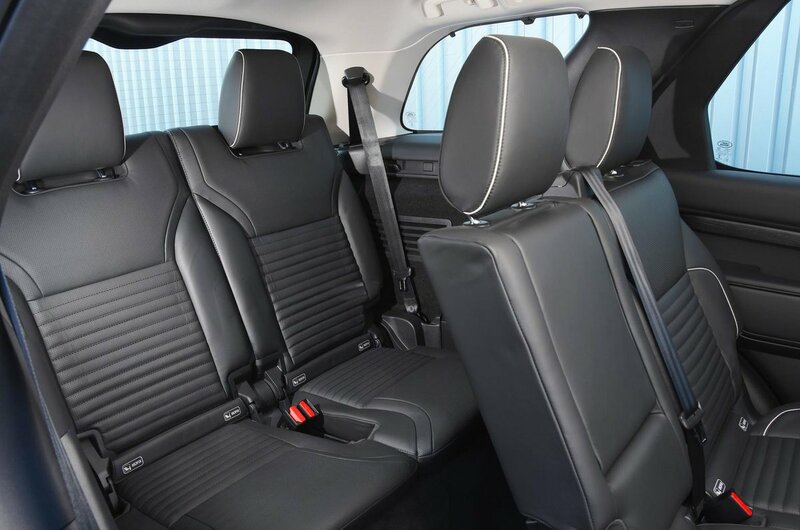 Even two tall adults will be quite comfortable back there, thanks to considerably more space all round than the Q7, XC90 and BMW X5 can offer. There are even soft pads just under the rear windows so each passenger has a comfy armrest. Each door bin on the second row can hold a 0.5-litre bottle of water and there are even small stowage areas for passengers on the rearmost row. Meanwhile, all but entry-level S models have two cupholders in the second-row central armrest. Perhaps most impressive are the five ‘intelligent’ rear seats that come on high-end versions. These can be raised and lowered electrically, either by pushing buttons in the boot or via the touchscreen on the dashboard. You can even do it remotely by downloading a Land Rover app on your phone. The seats take just 14 seconds to fold down. And if you’re worried that electric folding seats and young kids won’t be a good combination, Land Rover has thought of that, too: all five rear seats have weight sensors to stop them from moving if someone’s sitting on them. 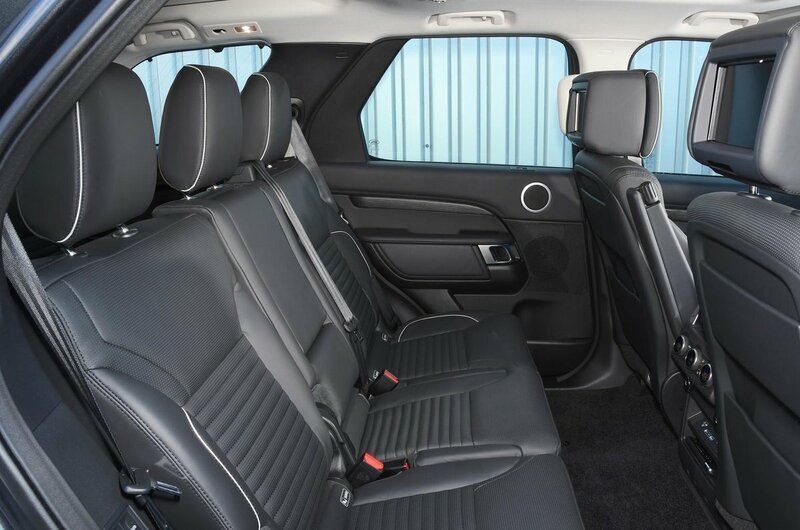 As you’d expect, the second-row seats slide and recline on all versions of the Discovery and the third-row seats fold away into the boot floor – you just have to do the job manually on the cheaper trim levels. The only minor disappointment is that the second-row seats split 60/40 rather than the more convenient 40/20/40 arrangement offered by some rivals. The available boot space will depend on how many passengers you’re carrying, but whichever of the 21 seating configurations you’ve chosen, the Discovery leaves at least some room for luggage. In five-seat mode, there’s more than enough space for a camping holiday for four. With all seven seats in use, there’s room for only a few small shopping bags; both the Q7 and XC90 leave you with a fair chunk more space to play with. There’s no split tailgate like there was on the previous Discovery (2004-2017), but you needn’t mourn its passing because part of the boot floor now folds out, overhanging the rear bumper and presenting you with a handy perch for taking off your wellies. All versions of the Discovery have a powered tailgate. On those occasions when your hands are full, simply waving a foot under the rear bumper will open the gesture-operated tailgate of HSE models and above.